Although the figure for the number of people killed or seriously injured (KSI) down slightly since 2017, statistics for the year ending June 2018 show 26,610 people have unfortunately died or been severely injured on the roads of Britain. As a result, motoring specialists at Click4reg.co.uk decided to take a closer look at the three most common reasons drivers have road accidents, resulting in a police officer attending the scene. The data was put together by analysing figures released by GOV in Nov 2018 for all 33 London boroughs. The data included 78 causes of road accidents, and Click4reg.co.uk opted to narrow down the most common causes, by ranking each London borough from highest to lowest by adding up the figures for the three most prominent causes of accidents in 2017. Interestingly, the results show that the most common cause of incidents where a police officer had to attend the scene was the same for all London boroughs and it was caused due to the “driver/rider failing to look properly”. The second most common reason was the same for nearly all boroughs (“driver/rider failed to judge other person’s path or speed), except for Westminster and City of London, where the “pedestrian failed to look properly” with 240 and 39 accidents reported respectively in 2017. Collectively, Westminster topped the table, with the added total for all three most common causes of accidents the highest out of all London boroughs (957). Click4reg can reveal that the most common reported road accident where a police officer attended the scene in the City of Westminster was because the “driver/rider failed to look properly” (500 incidents). In second place was “pedestrian failed to look properly” (240 incidents), followed by “driver/rider failed to judge other person’s path or speed” (217 incidents). Lambeth (743), Southwark (669), Barnet (645) and Wandsworth with 635. 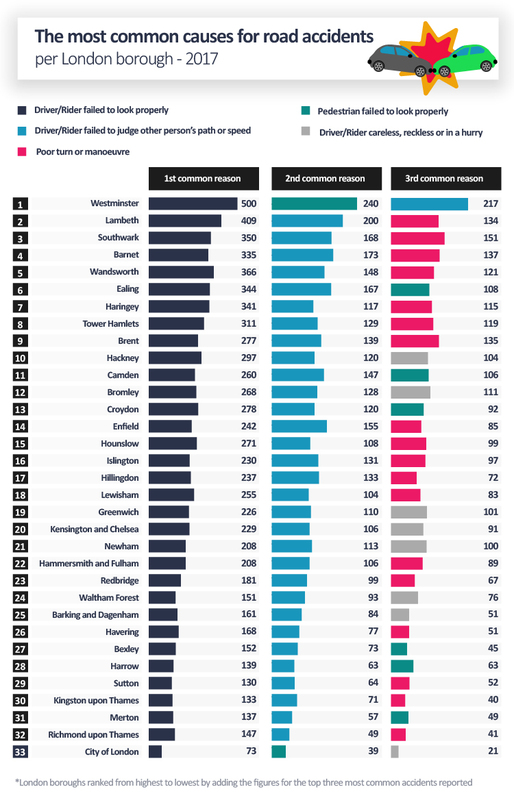 The London borough of Lambeth ranked a high second, with 409 incidents where the “driver/rider failed to look properly”, followed by 200 incidents where the “driver/rider failed to judge other person’s path or speed”. The third most common reason why a police officer had to attend the scene was caused due to “poor turn or manoeuvre” (134 incidents). Kingston upon Thames (133), Merton (137), Richmond upon Thames (147) and City of London (73). 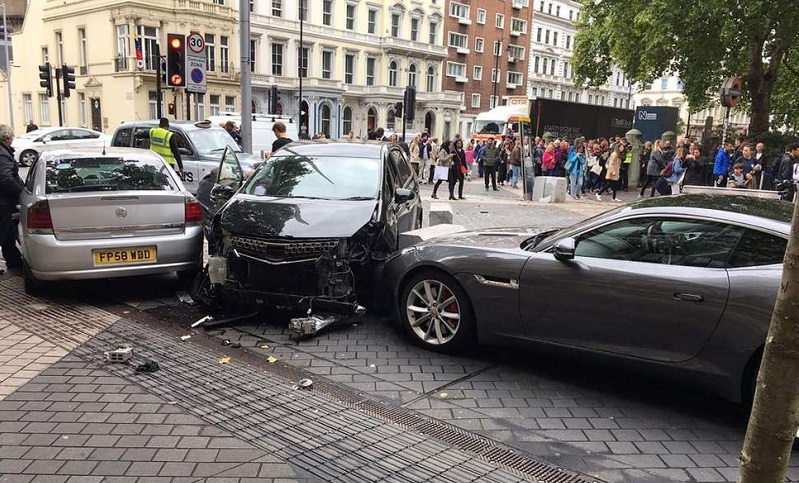 City of London was the borough with the smallest total for the three most reported reasons why a car was involved in an accident, with 73 incidents where the “driver/rider failed to look properly”. In total, the City of London had just 133 reported incidents caused by the three most common causes analysed in 2017. Interestingly, the third most common reasons drivers were involved in an accident were very mixed for all London boroughs. In total, there was a variety of four causes; although “poor turn or manoeuvre” reappeared more frequently.